The CW has released a new promo for "Collision Course", the upcoming fourteenth episode of Arrow's sixth season. The episode will see the two factions of Team Arrow continuing to be at odds with each other, but now over a new subject - how to find and deal with Laurel Lance/Black Siren (Katie Cassidy). At the end of tonight's episode, Quentin Lance (Paul Blackthorne) took Laurel on a sort of road trip, determined to help her on the path to her redemption. 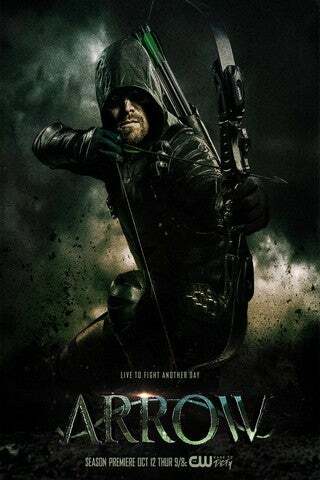 While most of Team Arrow seems to believe that Laurel deserves a second chance, Dinah Drake (Juliana Harkavy) is determined to kill her, as a way to avenge the death of Vigilante. Fans have clamored for the Earth-2 version of Laurel to be redeemed for pretty much exactly a year now, largely through tweeting with the the #RedemptionForBlackSiren hashtag. And judging by recent hints, some are more confident than ever that it could happen. "I do think there's a chance at redemption for her." Cassidy told ComicBook.com last year. "I think there will be people who understand when she has the opportunity and once we learn what she's gone through, why she is the way that she is. I think people will be able to relate to it, have sympathy for her. I think there's a chance at really helping her get back to who she is at her core, and potentially not be so crazy, and have a good side to her, but I think as time goes on we'll learn that." You can read the full synopsis for "Collision Course" below. Oliver (Stephen Amell), Diggle (David Ramsey) and Felicity (Emily Bett Rickards) disagree with Dinah (Juliana Harkavy), Curtis (Echo Kellum) and Rene (Rick Gonzalez) on how to handle Black Siren (Katie Cassidy). The two teams face off and a fight ensues. Ken Shane directed the episode written by Oscar Balderrama & Rebecca Bellotto (#614).